There are a number of good audio editing software packages to choose from when editing and producing audio. I use several expensive software packages, plugins and pieces of equipment in my profession. However, in the spirit of ‘Video Soundtracks on a Budget’ I am not suggesting using any of these, instead we are going to use open-source software ‘Audacity’, which is completely free. You will need is a PC or laptop, but I am presuming you already have this. 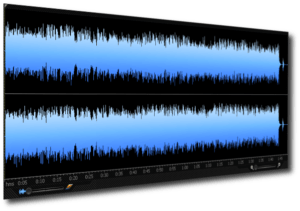 This free audio editing software is an ideal tool on limited funds as all of the principles that you will learn are transferable. You can always invest in more professional software in the future if you find that you have outgrown Audacity. It’s very simple to install. You will see a link to download Audacity. Click on it and you will be able to download it to your computer. Do make sure you download it from the official site. This is important as I have seen non-official websites that charge money for this free software. The coming blog posts in this series will have videos in them, so it is time to download and install Audacity.